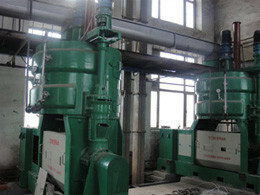 The harvested sunflower oil seeds are passed over magnets to removal any metal traces, and other impurities are being get rid off by cleaning sieve and destoners. Then the outer covering (hulls) of the seeds are removed to obtain pure seeds. The de-hulled seeds are ground into coarse meal to provide a larger surface area to be pressed. Hammer mills or grooved rollers are used to crush the coarse meal into uniform fine particles. Then the meal is heated to enable oil extraction, though impurities are released with oil during this process and such impurities should be removed before the oil is declared edible. 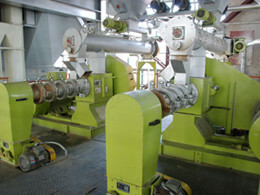 The heated meal is fed into a screw press which progressively increases the pressure from sixty kilopascals (kps) to 950kps, 206kps, to 850kps as the meal is passed through a slotted barrel. At the same time, the oil is squeezed out through the slots in the barrel and recovered. 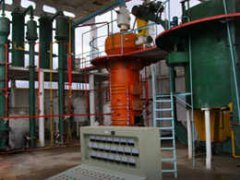 Volatile hydrocarbon solvents are used to process the remaining oil cake through solvent extraction so as to achieve maximum yields. The most commonly used solvent is hexane which dissolves the oil out of remaining oil cake. The solvent is then distilled out of the oil, passed through the matter and then collected at the bottom. Around 90% of the volatile solvent left in the extracted oil, evaporates and it’s collected for reuse. Then a stripping column is used to retrieve the remaining solvent. 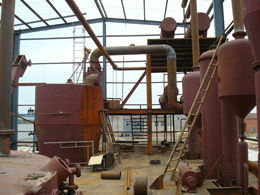 In this process, the oil is boiled by steam and the solvent evaporates, condenses and is collected separately. 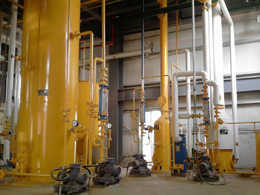 Sunflower oil refining involves removal of the bitterness, color and odor. First the oil is heated at temperatures between 40 0C and 85 0C. Then it’s mixed with an alkaline substance like sodium carbonate or sodium hydroxide. 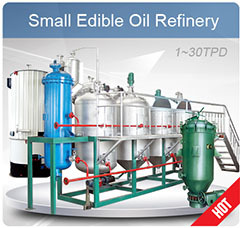 The oils are degummed by treating them with heated water at temperatures between 85 0C and 95 0C or with acidified water. This precipitates out most of the gums usually phosphatides. Then centrifugation is done to remove the dregs. The edible oil used for cooking is obtained by filtering it through activated carbon, activated clay or through fuller’s earth which adsorbs the pigmented substance from the oil. However, the oil intended for salad dressing needs refrigeration. 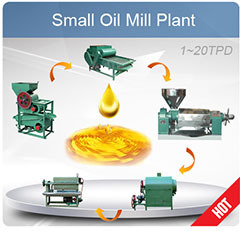 Such oil is obtained through winterizing by rapidly chilling and filtering to remove waxes. This procedure is applied to prevent solidification of the oil in the refrigerator. The final step involves deodorizing the oil by passing the steam over hot oil placed in a vacuum at temperatures between 225 0C and 250 0C. This allows the volatile components responsible for the taste and odor to evaporate from the oil. One percent citric acid is added to the oil to inactivate any trace metals present, hence preventing oxidation within the oil, thereby prolonging the shelf life of the oil. PS: Some smaller plants are only press-plants and do not apply the step of hexane extraction. This results in higher oil content in the meal. 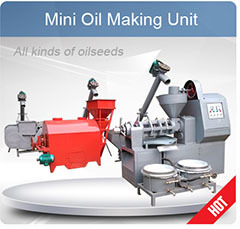 The most common product of the sunflower seed oil making is the oil seed cake/meal, which is usually used to make animal feed and low-grade fertilizer or partly disposed. 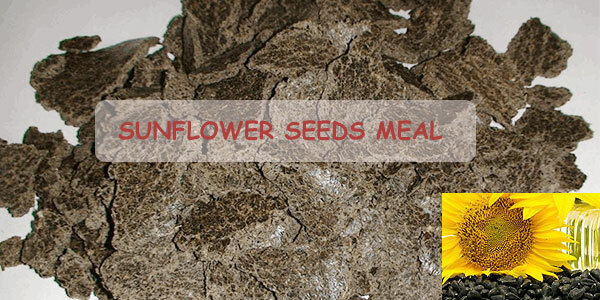 Sunflower meal is a successful substitute for soybean meal in equal protein diets for ruminant animals, as well as for swine and poultry feed. Meal produced from undehulled seeds, containing around 28% protein and 25%-28% fiber. Meal produced from seeds with 2-step de-hulling process, containing 40%-42% protein and 12%-14% fiber. 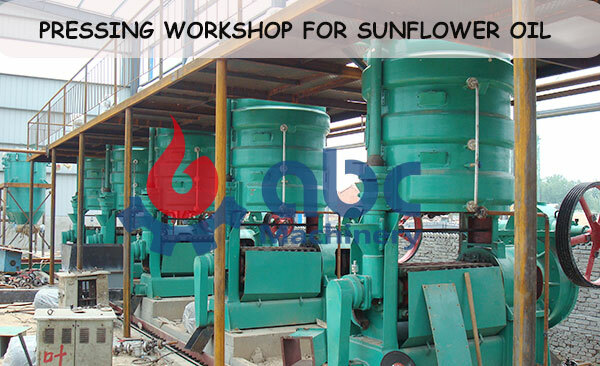 The meal composition thus depends on the efficiency of the de-hulling, and the oil content of sunflower meals ranges from 1.5% to 2.5%, depending on oil extraction efficiency and raw materials. Fresh sunflower meal must be dried for optimal storage. It can be ground, broken into small pieces or pelletized for easy handling and storage by processing under high pressure in an pelletizer or extruder, with an addition of proper binder such as molasses, fats, etc.